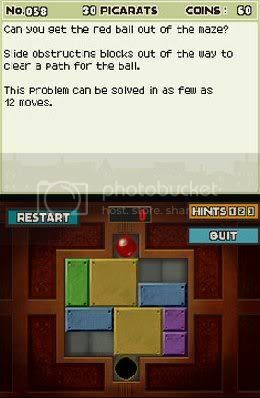 by PaulEMoz in "Curious Village", "DS", "Level 5", "Nintendo", "Professor Layton", "puzzles"
Professor Layton is a curious title. It's renowned for being caught in the great Woolworths crash of 2008, when every copy in England seemed to be stuck in a warehouse, and those that had made it into the wild were selling for eighty quid that Christmas. Eighty quid! People were desperate to get their hands on it. But why? For £8.99 from Cash Converters, I decided to find out. This is a puzzle game. So yes, you might be wondering, what was I playing at? I have little love for puzzle games. But it did promise to be a bit different from the norm. For one thing, it's not a match three game... nor is it a Tetris-esque "fill the holes with the shapes" type of game. Thank Christ for that! I hate most of those. It's not intuition. I already knew that letting a kid read the map would be trouble. No, Professor Layton and the Curious Village is a mystery wrapped in a puzzle, quite literally. The good Prof has to solve a mystery to obtain a great treasure, a Golden Apple, and to do so he must travel to the village of St. Mystere and solve the puzzles within. And what a lot of puzzles there are! And several different types, which means that your brain really does get a bit of a stretch. Some are fairly straightforward, enough for even my meagre brain to cope with. Others, though, are right bastards, and when they tell you you're wrong, you're very likely to question them. Out loud. Strongly. Haha. Yeah. 12 moves for you, maybe... 112 for me, more like! The game is tremendously well put together, and beautiful, too. When I got to the title screen and saw that it was by Level 5, who were responsible for Dark Cloud (among others), it came as no surprise. I knew I recognised the style from somewhere, and it helps to make the game even more appealing. 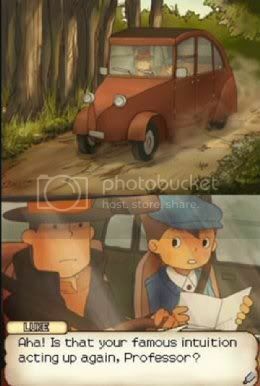 Professor Layton and the Curious Village is a great little game. It's interesting, beautifully presented and a real workout for the brain, set out in a style that is very unlikely to irritate. And it's very easy to just pick up and play for a few minutes, whenever you feel you've got the time. I'm very likely to do just that, which is something to be said for a puzzle game!